My mom used to make us rice pudding when we were kids and it was the ultimate treat during fall and winter mornings in Brussels. 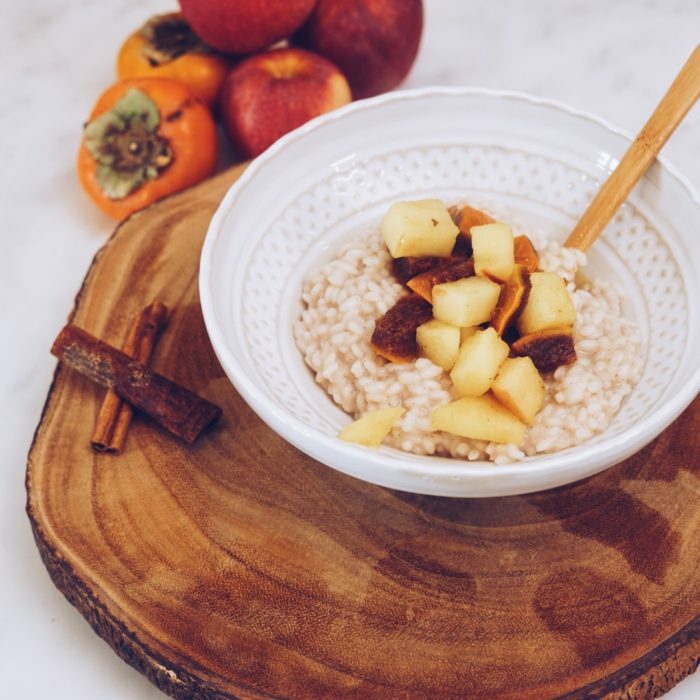 I used hazelnut milk here for full flavor and spooned a homemade persimons-apple compote to give it an even more fall feel. Bring the rice and water to boil and simmer until most of the water is absorbed. Gradually add the milk and keep on simmering until you get a super creamy consistency and the rice is not hard anymore. Meanwhile, cut h maple and persimmons and cook with the orange juice and cinnamon stick until fruits soften. When rice is cooked, add the vanilla and maple syrup and taste to see if it needs more milk or sweetener. Serve in a bowl and spoon some of the compote on top and enjoy!